Spring has sprung across North America (finally) and people have started to turn their attention to outdoor projects. We commonly get asked about plastic sheeting for greenhouses and awnings, which ends up being the same product: twin-wall polycarbonate. This cost-effective, low-maintenance product excels in both commercial and consumer applications. In many ways, twin-wall polycarbonate has the potential to bring together the everyday consumer and industrial plastic. Twin-wall polycarbonate differs from its smooth, glass-like sibling in a few key properties. Firstly, the twin-wall is made out of long “cells” that stretch down the entire length of the plastic. In essence, twin-wall is two parallel lengths of polycarbonate that are supported by these many walls. The product is also much cheaper than regular polycarbonate sheet and perhaps most importantly to the application itself, twin-wall polycarbonate is UV-stabilized while regular polycarbonate is not. That is an extremely important point, as regular polycarbonate will quickly discolor and crack within a few years of sun exposure. Twin-wall is not immune from weathering, but it usually takes 8-10 years before you start to see any effects with replacement common around 12-15 years. While most smooth polycarbonate comes in 4′ x 8′ sheets standard and the thickness of the sheets also in imperial measurement, the twin-wall actually comes in 4′ x 10’s though other sizes are available. Twin-wall’s thickness is also measured in the metric system (millimeters) and this includes in the U.S. Twin-wall is easy to work with using household tools such as power drills or table saws. It does not require special hardware such as special screws to affix, 3/16″ screws from any hardware store are the most commonly used by our customers. The thickness of the plastic is an important point to discuss. Many customers in North America request twin-wall that is thicker than required (8mm+). We stock 6mm only, and have had no complaints even from customers in Northern Canada. What people need to realize is that going with thicker twin-wall does not mean a “better” product for them. The heat insulation value (R-value) does increase; however, the light transmittance value falls. 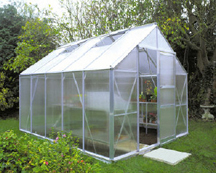 This is especially important in greenhouse applications as it means your plants get less sun energy the thicker you go! For questions or a quote on twin-wall polycarbonate or help with our other products please contact us today.